I am so behind...the end of the year really got away from me. 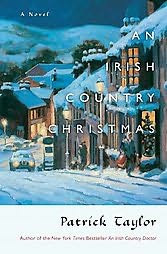 I am finally doing my wrap-up post for my Christmas Reading Challenge and a mini-review on the last book read for the challenge, An Irish Country Christmas by Patrick Taylor. 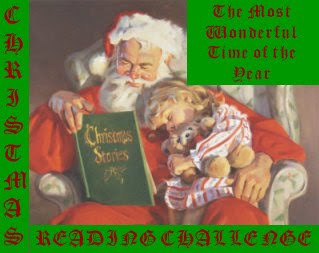 The guidelines for the challenge were to read 1-3 books, but I actually made my list of four. Unfortunately, I didn't get to A Christmas Carol this year, but I have read it several times in the past and I watched about ten movie versions AND saw a live play so I think I'm good with ole Dickens this year! Since I did finish three books, I would say the challenge was a success! And thanks again to everyone who participated. I hope everyone had fun with it. I will be hosting it again next year, but I think I will extend the deadline until Twelfth Night (January 6th) for those of us that keep the season a little longer. Along with his senior partner, Doctor Fingal Flahertie O'Reilly, Barry has his hands full dealing with seasonal coughs and colds, as well as the occasional medical emergency. To add to the doctors' worries, competition arrives in the form of a patient-poaching new physician whose quackery threatens the health and well-being of the good people of Ballybucklebo. Can one territory support three hungry doctors? Barry has his doubts. But the wintry days and nights are not without a few tidings of comfort and joy. Between their hectic medical practice, Rugby Club parties, and the kiddies' Christmas Pageant, the two doctors still find time to play Santa Claus to a struggling single mother with a sick child and not enough money in the bank. Snow is rare in Ulster, and so are miracles, but that doesn't mean they never happen. . . Thanks for stopping by, I am a big fan of Elizabeth I, even though I am Irish, and I can't change history. Can you imagine, knowing what we know now if we could. I loved the challenge and can't wait until the next one. I ended up reading way more than 3 Christmas books and actually bought some more at 70% off last week. Maybe you could do a Christmas throughout the year challenge to keep us in the spirit of the season! Thank you for posting this review! I picked this book and the country doctor one at my local used bookstore, but then didn't have time to read them. Now I'm excited to get home and start them both. I'm also looking forward to following your blog.